The mandate of the Blood in the Snow Canadian Film Festival is that it only plays Canadian genre films. Isn't it nice to know that our big country with the tiny population houses so many demented minds that they can fill a weekend of Canadian genre cinema. During the final weekend of November at the Carlton Cinema here in Toronto you can see the latest flicks from Larry Kent (She Who Must Burn) and Chad Archibald (Bite). There is also a terrific selection of short films and to round out your festival experience BITS also has seminars on marketing, makeup effects and postproduction by filmmakers with lengthy dockets themselves. If you want to attend any of screenings you are going to have to act fast. As of this publication the screenings for Bite and Secret Santa have already sold out. That is a first for the festival, two sold out screenings in less than 72 hours from announcing their lineup. You can buy tickets for the rest of the program here. A team of Paranormal Investigators venture into the infamous Farhope Building with the dreams of landing a TV deal, but get more than they bargained for when they come up against the most powerful spirits they've every faced. Once inside the building the spirits begin manipulating the team members, and the higher they climb the more everything spirals out of control. An anxiety-ridden art dealer (Nelson Leis) confronts a thief (Vanessa Walsh) at his art gallery reception, only to come face to face with his own Shadow Self. After his world crumbles, Joseph will stop at nothing to find his wife while battling demons, psychopaths, and the ruler of this new apocalypse... a warlord known only as The Hat. A young girl, her dog and a stranger find themselves trying to hold onto their humanity when stranded together in a post apocalyptic world. In an ever-crowded marketplace it is more and more it is up to the filmmakers to market their films. Join us for a round table discussion about how you can position your film best both to attract distributors and to get your films out to the public. Join us for a panel discussion with Susan Curran (Director of Marketing at Anchor Bay Canada/ Starz Home Entertainment), Avi Federgreen (Producer and Owner of IndicCan Entertainment), and filmmaker Gavin Michael Booth ("The Scarehouse"). A girl's inner struggle with self-hate comes to life in a terrifying nightmarish form. A young girl's dream of becoming the savior of mankind by giving birth to the devil comes alive in this tribute to silent-era horror. A lonely, conflicted hobo lives an existence defined by a dark, insatiable need. On this day, he crosses paths with a mysterious man who's also defined by an all-consuming, singular drive. When Hallowe'en is hijacked by a Japanese doomsday cult, a girl and her siblings are forced to flee into the harsh conditions of winter. A young couple purchase their new home to start a life together, only to find out the elderly couple next door have other plans for them. A traveling salesman reveals himself as a psychopath when he tries to fill the void his parents left. A man returning from a business trip saves a teenage girl from drowning. She disappears a few moments later, leaving the man quite shaken. His girlfriend tries to cheer him up, but she disappears too, when the teenage girl suddenly comes back. After a supermodel is bitten in the water by a mysterious creature while on a photo shoot at the beach, an infection takes hold that changes her behaviour and appearance. Over time she turns into one hell of a demonic sea siren whose thirsty for blood. Five female filmmakers en route to screen their new horror film in Los Angeles, experience their own real life terror when they cross paths with deranged scientist hellbent on using them for his mysterious experiments. Two friends try to survive an encounter with a couple of backwood cannibals. A Horror/Comedy that tells the story of a group of eccentric college kids, struggling to get through the hectic exam period. A liquor filled party is planned with them adding a Secret Santa exchange for fun. Little do our characters know... a killer is in town and has a special present for all the good (and bad) girls and boys. Dare to open your present? It might be your last! Carolers out to spread Christmas cheer get more than they bargained for at Mabel's house. One of the keys to any great horror film big or small, is the bloody makeup effects. 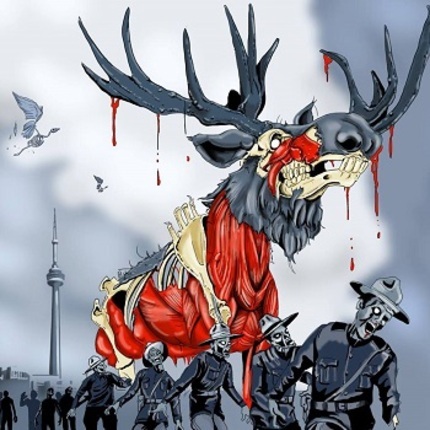 Join us for unique discussion with some of the top Special Effects Makeup artists in Canada today. They will talk about their experiences making indie movies and their tricks of the trade. This will follow by a practical special effects makeup demonstration by Ryan Louagie of "The Butcher Shop". The Baarkers, a family group of religious fanatics who believe they are God's chosen ones, polarize a town and force it's residents to fight for their lives as their zeal turns murderous and the rule of law decays into brutish mob mentality. Pushed to her breaking point, an abused woman must decide whether to stay silent or fight back. The postproduction process is one of the most important but least understood and least planned stage for filmmakers. Join us for an in-depth panel with leading sound designer/mixer George Flores, composer Steph Copeland and filmmaker and editor Justin McConnell that will discuss with you the best way to plan your postproduction on your next film. AND THEY WATCHED is a horror morality tale about the custodian of an electric chair and its last casualty. Inspired by the recent reinstatement of the electric chair in Tennessee, US. A woman and her child visit a Bed and Breakfast in rural Quebec unaware of the town's history of child murders at the hands of an ancient Bonesetter.